Well, yeah. I do 30k plus a year. I wouldn't say I specifically 'need' a diesel. But I do need more than 40mpg, combined, and preferably more like 50. If a petrol car of sufficient size (ie, small estate) could manage that then I'd prefer it. But with the exception of stuff like the Toyota pious - they can't. Very impressive average mileage............ I have to drive carefully on M/Ways & A Roads to get that sort of consumption. My mean av consumption so far (9,000 m ) is 47 mpg with mostly "urban" driving & around 25% M Way/A Road. Could be a lot worse from what I've read on here though. Hard to tell if there is any performance difference as I'm not an "enthusiastic" driver these days but it "felt" as though the car ran a little sweeter on my usual Shell fuel. was, 1.5Dci (61) ...Ntec...Nightshade..... wish I still had it. Mine gets "whatever". Asda, Tesco, Morrisons. The only time it gets BP or Shell or whatever is when I'm low on fuel and there isn't a supermarket available. I have to say that most road tests do not bare out the manufacturer's claims. For sure. 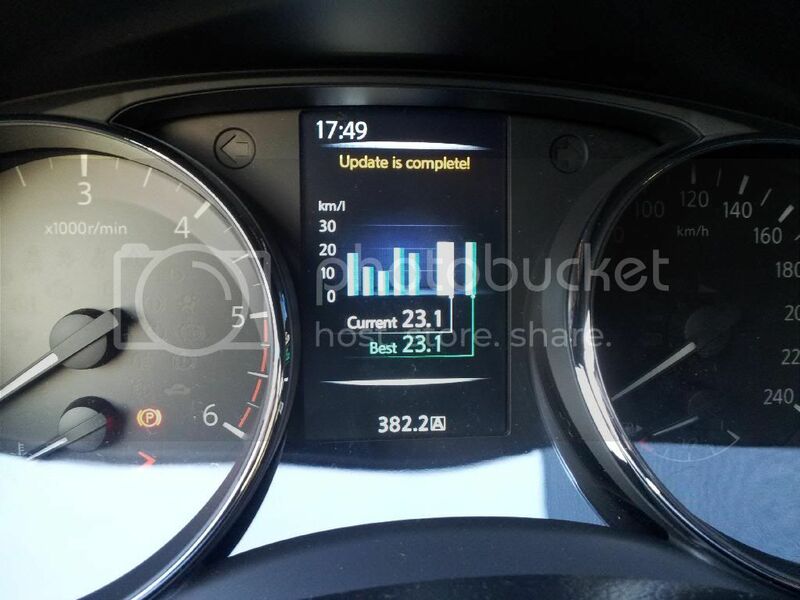 The Offical fuel consumption figures are only a very, very rough guide to what you'll actually get. But I've achieved anywhere between about 70 and 90+ percent of what they claim for "combined". The bit I really don't understand is that I've had some cars when you can drive them any way you like and they achieve consistent results, whether you're ringing it's neck or ticking it along (often the case with smaller Petrol engines). But other cars where once decent run through the gears (to overtake, for example) can drop the average by 10 percent on a 50 mile drive. I've certainly noticed that the turbo diesel cars start to use a LOT more fuel when you bring the turbo in. none moreso than the Golf I have for a while which did 55mpg at 50 mph and 40 mpg at 60 mph (because the turbo kicked in in top gear at about 55mph). But if I tickle my Qashqai along I can just manage 40mpg, provided the road and traffic aren't too bad. But give it the beans and i'll be averaging 20mpg over any length of journey. On a recent 2-day trip to the UK (so 90% motorway top speed cruising) I got 9.3l/100km (30.37mpg). The overall average for 18,500km (11,562m) in 2.5 years is 12.5l/100km (22.6mpg). Thank goodness most of my journeys are only short distances. If you click on the fuel consumption link in my footer, you can see the total history. There seem to be a few other owners of the same model in Europe who have similar poor consumption and they all have relatively low mileage for the ages of their vehicles..
Are you sure your car isn't staying on 'cold start mode'? I doubt it as the revs drop to 900rpm. My daily commute is 106 km and I have tested the fuel economy the last 5 days since I bought the car by setting the cruise control to 120 km per hour . 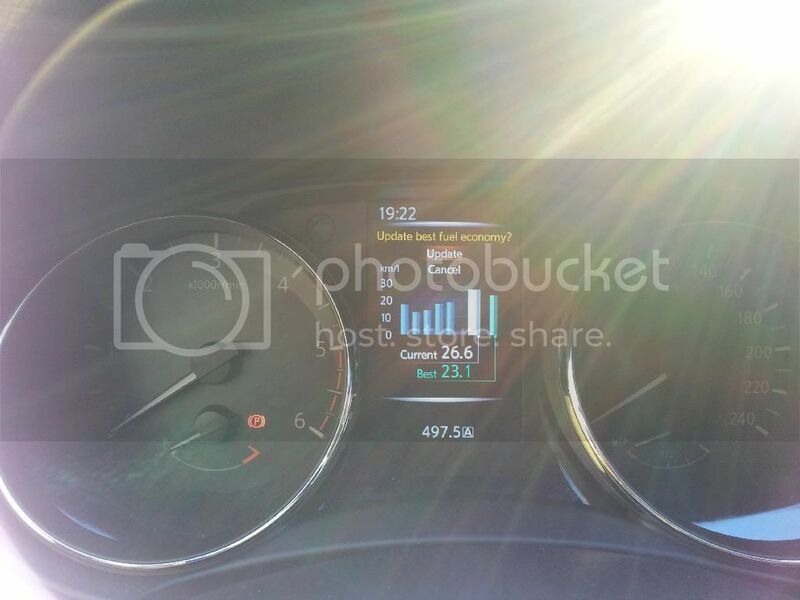 My best consumption is 20.3 km per liter (57 mpg) and I hope to do better. Bearing in mind that Nissan advertises 26 km per liter in the manual for this model , I do not think It done badly. I'd say 57mpg is exceptional irrespective of advertised... wish I could get mine up past 50!! Averages for the round town kind of stuff we do. Good number! It's flippin fantastic ! Wow, that is impressive! Was it down hill, with a tail wind, driving at a constant 55mph? Is that graph straight from the QQ? Looks like a cool feature if it is! Although seeing two lines under the 30mpg mark, looks like you have been doing a mix of driving! Edit: And perhaps the real challenge is to get all the way to that 90mpg line!!! My 40 mile commute this morning (but in the reverse direction) showed 72.2mpg on the car Generally for my work commute the car will show in the region of 63mpg for the journey into work (Swindon-Bristol) and 66mpg for the return commute home, slipstreaming seems to make a fair bit of difference to the fuel economy (as is to be expected!) but because we live in such a f**kwit litigious society where people can't think for themselves and always want to apportion blame to everyone else for their actions apart from their stupid selves then I recommend you do NOT try this at home kids! If it's worth anything, the car had just me in it, 3/4 tank of fuel and no other luggage. It's getting better as the miles rack up :-) Same 40 mile commute BTW. I just beat my own record . I drove to my local model airfield with my model plane in my boot hence I drove very carefully not to damage it .